Volunteer Audrey Ahana adds a festive touch to the entrance of Foster Botanical Garden in preparation for the "Nutcracker Sweet" event. THE CHRISTMAS shopping rush started in full force this weekend, with only 26 days left to shop at crowded malls, where cashier lines are long and finding a parking spot late in the day is nearly impossible. It's almost enough to make you want to cut your list short or just start handing out Christmas gift IOU's for February. 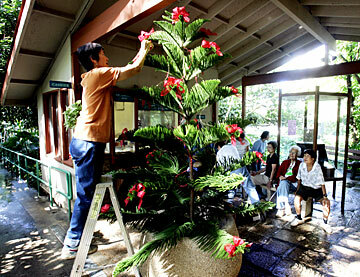 The staff at Foster Botanical Garden is hoping your shopping experience won't come to that extreme. On Saturday the garden will be the site of an alternative, serene shopping experience dubbed "Nutcracker Sweet." "The garden is peaceful -- it's a great place to get away from it all," said Grace Dixon, one of the event organizers, who promises, "We will have wonderful gifts for people who have everything." Many of the items are purely "Martha Stewart," such as decorated baskets housing potted herbs and living Christmas trees and wreaths. "We are teaching people what they can do themselves," Dixon said. "We are trying to get people to do more gardening, even if it is in a pot. It's also something you can do with your kids." A group of volunteers started preparing the garden last week. "We hand-paint pods and create decorations all year round," said Terry Teal, a six-year volunteer busily transforming plant material into sculptural objects. Autograph pods were transformed into octopuslike creatures, and looking-glass pods became fish, complete with draco dracena tails and wiliwili seed eyes. Lau hala ornaments also adorned the trees. Karen Miyano, a Friends of the Botanical Garden board member, decorated Christmas trees that will be auctioned off at the event. 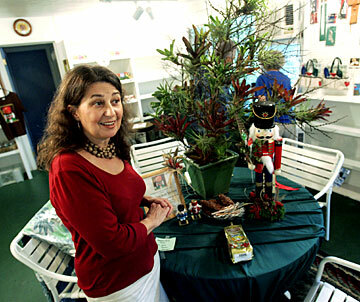 She started with a Wodyetia Palm Inflorescence and added bromeliad, tillandsias and other natural garden materials. Karen Miyano shows some of the items that will be for sale. The tree, a wodyetia/palm infloresence, is decorated with tillandsias amd bromeliads. "People who buy them can enjoy them for many years to come, not just for one season," said Miyano. "It beats the half-dead pine trees that arrive from the Northwest." Ideally, the trees should be kept outdoors, she said. But, they can be kept indoors and misted. The Wodyetia is native to Queensland, Australia. "We want to promote using living material instead of buying a lot of plastic," said Dixon. Among the unique items are salad bowls, where baby lettuces are grown. "You pluck a few leaves of lettuce, and it keeps on growing," she said. The lettuce bowls will be sold with dressings. Al Lum was dressing up some nutcrackers with garlands made from garden materials such as juniper, evergreen, pine cones, moa and wood rose. He also added some candy and made lollipop bouquets for them to hold. The herb trees and plants include the cacao, cinnamon, nutmeg and cashew trees, bay leaf and thyme plants and more. Also available will be a variety of ferns, including some rare specimens from Tahiti, said Dixon. Chocolate is another focus of the event. In addition to the offering of the cacao trees, guests will speak about chocolate and chefs will present food demonstrations. Martha Sanchez, owner of Mercado de la Raza, is cooking chicken mole tamales to demonstrate the use of chocolate in Mexican cooking. Recipes will be provided. Sanchez also plans to make champurrado, a traditional Mexican Indian drink comprising chocolate and cornmeal. Both the drinks and tamales will be sold, along with samples of Mexican, Cambodian and Peruvian chocolate and Mexican cinnamon. 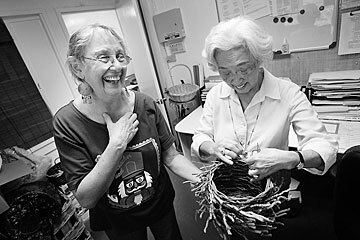 Grace Dixon, left, and Carol Kim show one of the baskets that will be filled with herb plants and offered at the Foster Botanical Garden's "Nutcracker Sweet" sale. For those who appreciate hands-on experiences, Skip Bittenbender from the College of Tropical Agriculture at the University of Hawaii will explain how to process your own cacao beans, and a Y Hata chef will show how to use different chocolates as a dip. Whether you're shopping or just taking in the demonstrations and enjoying a bit of peace while strolling the grounds, guests will be able to admire the elaborate garlands that decorate the garden. Ultimately, Dixon says she hopes a visit to the garden will leave an impression beyond the holidays and "get people excited about growing things."